National Hardware Carriage Bolt and Nut, Series: V7652, 1/4-20 in Thread, Flat Head, 1-3/4 in Thread Length, Steel, Zinc Plated, Used With Wood or Steel Garage Doors National Hardware Bolt and Nut, Series: V7653, 1/4-20 in Thread, 1/2 in Thread Length, Ribbed Neck, Steel, Zinc Plated, Used With Fiberglass Garage Doors Heavy-duty galvanized steel pulley used at stationary or spring positions. Galvanized steel strap and case hardened steel race with steel ball bearings. Factory lubricated. Includes pulley, strap, and axle bolt with nut. 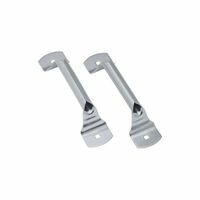 National Hardware Lift Handle, Series: V7638, 7-1/4 in Length, Steel, Galvanized, BHMA A138.18 National Hardware Door Roller, Series: V7602, Heavy Duty, Long Stem, 1-7/8 in Roller Diameter, 0.44 in Roller Width, 10 Ball Bearing, 7-9/16 in Overall Length, Plain Steel, 7/16 in Shaft Used on side by side hinge placements for added strength. Factory lubricated, steel inner race with 10 ball bearings. Roller 1-7/8" O.D. High-impact plastic for good performance and quiet, trouble-free operation in all weather environments. Roller 1-7/8" O.D. Used by most garage door manufacturers. Roller tube accepts a standard 7/16"OD stem roller. Made of 14 gauge galvanized steel, 3"W overall. Includes four 1/4"-20 x 1-7/8" pancake head carriage bolts with nuts. Factory lubricated, steel inner race. Fits 2" standard J-track. Roller 1-7/8" O.D. National Hardware Door Roller, Series: V7602, Heavy Duty, Suitable For Use With: Residential Garage Doors, 1-7/8 in Roller Diameter, 10 Ball Bearing, 4-3/8 in Overall Length, Plain Steel, 7/16 in Shaft National Hardware Swivel Lock, Series: V7645, Suitable For Use With: 5/16 x 5/16 in Shaft, Steel, Zinc Plated, For Garage Door Short stem heavy-duty roller with steel inner race; 10 ball bearings. Contents: 2 roller assemblies. Roller 1-7/8" O.D.